Wagga Wagga’s new mental health unit provides a world class facility to the people of the NSW Riverina. The development is a new insertion into the existing hospital precinct, and considerably improves the region’s capacity to respond to community needs. The site-specific design has been positioned sensitively within the landscape of regional New South Wales. A distinctive architectural statement for the city of Wagga Wagga, the building provides a hospitable and modern environment for the care and treatment of patients. The design acts as a catalyst for the healing process, embodying the calming and reflective nature of regeneration. The architecture recognises the civic nature of the building, drawing design cues from the surrounding rural landscape of the Wagga Wagga floodplain. 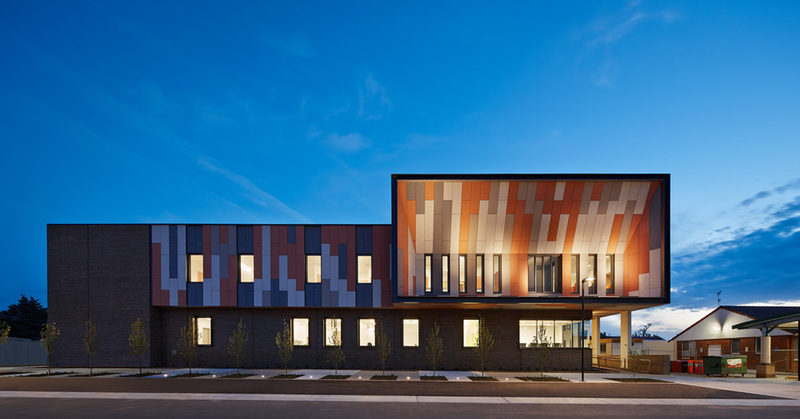 The distinctive north facade features a patchwork of colours in a vibrant rust-coloured hue. The earthy tones of the land reflect the rich and diverse country setting and surrounding face brick residential dwellings. In contrast, the interior architecture is soft and interconnected, engaging with the users and landscape. A familiar ‘home’ environment is created by modulating courtyard facades with feature garden spaces signifying growth and regeneration. The internal aesthetic takes on a calm colour palette of eucalyptus-inspired greens and greys evocative of the Australian bush and the hills of the Riverina district.